Eurotel Victoria Les Diablerets Les Diablerets, Hotel Switzerland. Limited Time Offer! Eurotel Victoria. "Eurotel Victoria" is a 4-star hotel. 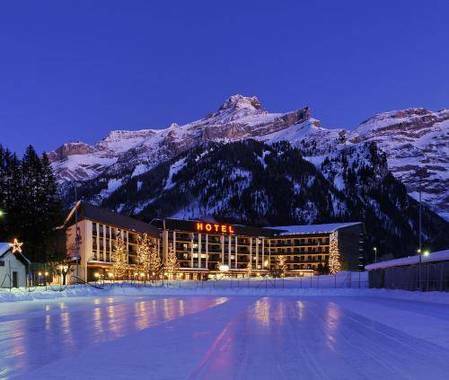 This accommodation is a convenient base point from which visitors can explore Les Diablerets. The accommodation's interior boasts its luxurious style. Every room in the residence has been described as being spacious. Hot weather is kept outside thanks to the relieving air conditioning. Some bedrooms offer the opportunity to step onto the balcony directly from your bedroom. Guests can take a swim in the covered pool. For visitors who like sporting activities, the residence offers skiing. Furthermore, there is a gym where you can train on your own. There is a sauna available, ideal for your well-being. You have the option to recharge your batteries with, for example, a relaxing massage treatment. There is no need to leave the comfort of the accommodation for dinner as there is an onsite restaurant. A lounge bar is available for guests to enjoy a drink after dinner. After a good night's sleep, you can enjoy breakfast, which is included in your stay.